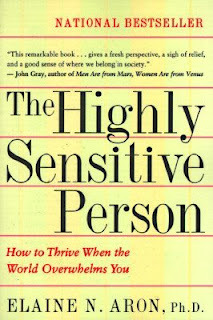 I was introduced to the idea that some people are "highly sensitive" when I read the book, Quiet. However, because "highly sensitive" is not synonymous with introverted, there was only brief mention of it. At the time I thought, yes, that describes me, but didn't give it much more thought until a few weeks ago when one of my sorority sisters linked to this Huffington Post article on Facebook. That started a whole discussion in which one person suggested reading this Atlantic article and another suggested reading the book The Highly Sensitive Person: How to Thrive When the World Overwhelms You. So what is this highly sensitive thing? Well, Dr. Aron says, "the Highly Sensitive Person (HSP) has a sensitive nervous system, is aware of subtleties in his/her surroundings, and is more easily overwhelmed when in a highly stimulating environment." Her website has a self test that can quickly help you identify if this is describing you. I checked off nearly everything on the list, so was pretty confident that this book was for me! 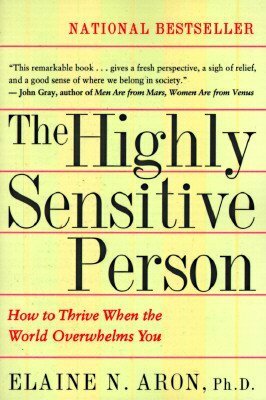 If you are not highly sensitive, I doubt you would get much out of this book unless you are reading it with the goal of better understanding a specific person in your life. If you are highly sensitive, please read the book! The book is divided into chapters that cover different aspects of life as an HSP and at the end of each chapter there are exercises. The goal of the exercises is to help you see your past in a new way based on your new knowledge. The exercises also aim to help you appreciate your HSP qualities and become the most whole version of yourself. At the end there is a chapter about therapy, and the pros and cons of medication, for people who want to go beyond the book's exercises. Last night my small group celebrated my birthday, and like last year, they honored me. One of the things that was mentioned a couple times is how I have a good sense of who I am as a person and who I am in the Lord. What a compliment! And I think it's a reflection of those around me. My mom, my husband, my friends, they all accept me and love me for who I am. They are all willing to go out of their way to make sure I am taken care of. And because of that, I am able to flourish with the unique gifts I have as an HSP, an ISFJ, and a beloved child of God. They also honored me for a variety of qualities that make me a good mom and teacher, nearly all of which stem from being an HSP! Oh, and as if there is any doubt that I am an HSP, while watching "Saving Mr. Banks" this weekend, I was so overcome by emotion that I could barely continue watching. The pain of her suffering was just too much for me. Even the next day I had trouble shaking that hopeless feeling! One last me story... One of the things Dr. Aron asks her patients is what their earliest memory is. She believes that even if it is not an accurate memory, it still says something about you. My earliest memory is of myself and my cousin at my Nana's house. My cousin forgot his blanket. I responded by ripping mine in half. 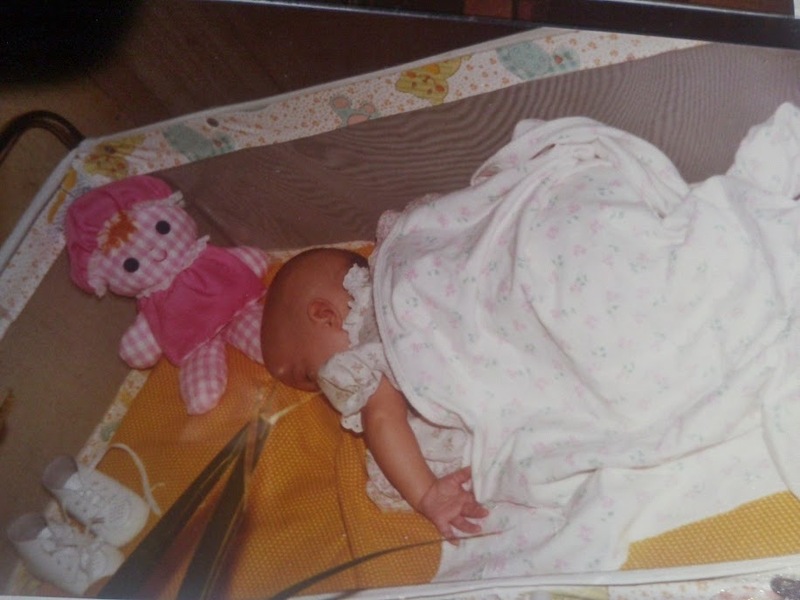 I guess even my toddler self couldn't bear the injustice and pain in the world! And given the current state of my blanket, I think this memory has a high chance of being accurate! It also illustrates nicely my intense inner world... I created lots of stories out of that tangle of strings and knots. Can you believe that it was once white with little pink flowers?! Oh, and last interesting point... often times in our culture, sensitivity is attributed to females, but there are an equal number of highly sensitive guys and gals, making up about 15 to 20 percent of people. OK, this post is really disjointed, but hopefully it made some sense! (I blame the wine I was drinking while writing it, but we all know that essay writing is not one of my strongest points!) Go over to Jessica's to read much more coherent book reviews! And if you're an HSP, and especially one who is struggling with understanding your uniqueness, get this book! I came across Dr. Aron's website awhile ago and took the test and found I am also an HSP. This can be both a burden and a blessing. I've never read the book so I was glad to see your review. I'll have to add it to my wishlist. I definitely know some HSP. It's good to know there are resources to go to for when I encounter them on a regular basis again. Interesting! I don't know if I'd have categorized myself as HSP, but I took the quiz and checked 19 boxes...so I guess I'll have to look into the book! I scored 13 on the self test. I guess that makes me a somewhat sensitive person. I definitely know that some things bother me more than others, like sound. Cannot.stand.needless.noise. Your book review and the whole concept of HSP are fascinating.